There are 34 Boston Harbor Islands encompassing 1,600 acres and 35 miles of undeveloped ocean shoreline. The Department of Conservation and Recreation manages seventeen of the islands, while six of these seventeen islands are open for visitors. It’s a good idea to know the “carry in, carry out” policy before visiting the islands. Since there is no food or water available on the islands, you must bring everything you need for the day with you. There are also no trash cans on the islands. Composting toilets are available. Pets are not allowed on any of the Boston Harbor Islands National Park Areas. Camping is only offered on Grape, Bumpkin, and Lovells Islands. 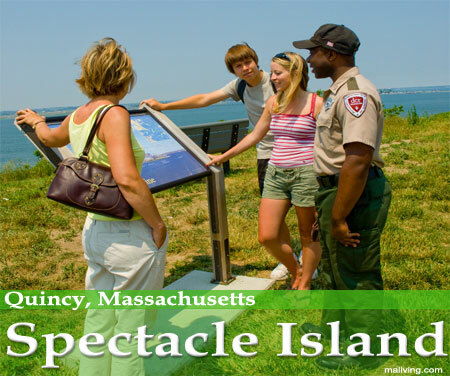 Be sure to call ahead when planning your trip to one of the Boston Harbor Islands. Ask us about visiting Massachusetts or share comments. To feature your MA business, contact us. The 35-acre Bumpkin Island holds the remains of a children’s hospital and a stone farmhouse. The slate and shell beaches are beautiful places to just relax, as are the many fields. Bumpkin Island offers only ten camping sites, so be sure to reserve your spot on the island well in advance if you intend to stay for longer than a day. Georges Island serves as the entrance to the Boston Harbor Island State Park. This 30-acre island is the hub of the state park. 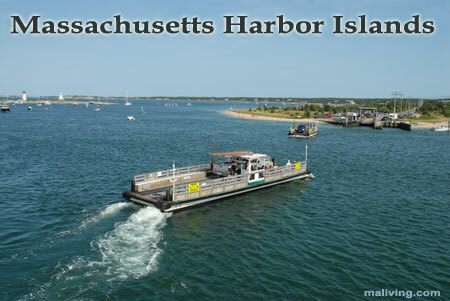 Being one of the larger islands, Georges Island actually offers free inter-island water taxi service, restrooms, running water and a concession stand. Georges Island is only open to the public through the summer months and early fall. Park rangers tours of the historical island. Fort Warren and the Civil War Encampment are just two of the interesting historical sites to see on this gorgeous island. Grape Island is appropriately named. This island was once used by farmer, berry bushes used to cover the island, and a few are still around today. Grape is one of the few Boston Harbor Islands that does not have any historic structures on it. Grape Island is a great spot for bird watchers and naturalists and provides camping opportunities. The entire span of Boston Harbor can be seen from Great Brewster Island. Accessible only by private boat, Great Brewster Island is filled with a broad range of native vegetation. Apple trees, pear trees, and many other varieties can be found here. Due to the diverse vegetation found on Georges Island, it is home to a wide range of bird species, making it a bird enthusiasts’ paradise. Lovells Island is a scenic Boston Harbor island, filled with wildlife and vegetation. While walking along the shores you will pass by dunes and salt marsh woods, rocky tide pools and some of the best views of the outer harbor. Lovells Island offers many camping and picnicking areas; there are also summer programs and special events as well. Lovells Island has maintained its rustic feel throughout the years, housing Fort Standish, which was last used in World War II. With 188 acres, Peddocks Island is one of the largest islands in Boston Harbor. The visitor’s center on the island will point you in the right direction for whatever you’re seeking; the remains of Fort Andrews, walking trails, campsites, and even educational displays on nature and history. Peddocks Island is full of natural beauty, don’t miss it. Spectacle Island is only four miles from Boston’s shoreline. The island is one of the highest points in Boston Harbor because of the Big Dig in 1992. During this time the excavated dirt and clay was used to resurface the island, then went on to plant thousands of trees and other vegetation. The island is open during the summer months, with two beaches, cafe, five miles of walking trails and a visitor’s center. The electricity on the island is harnessed by using solar panels; the technological island is a clean and friendly place to visit.